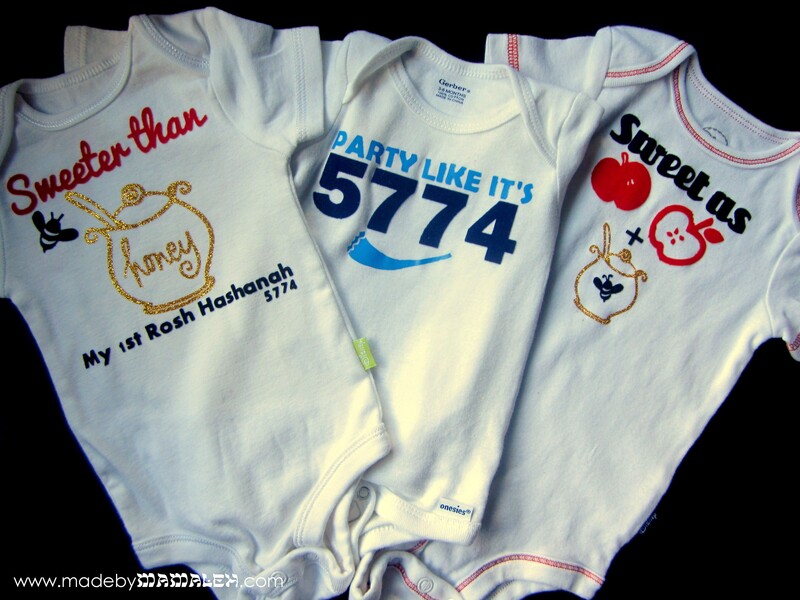 I happen to know a whole bunch of babies celebrating their very first Rosh Hashanah and thought I’d add some holiday flair to their baby gifts. To start, I needed the perfect canvas – nice, soft, solid colored bodysuits (onesies). 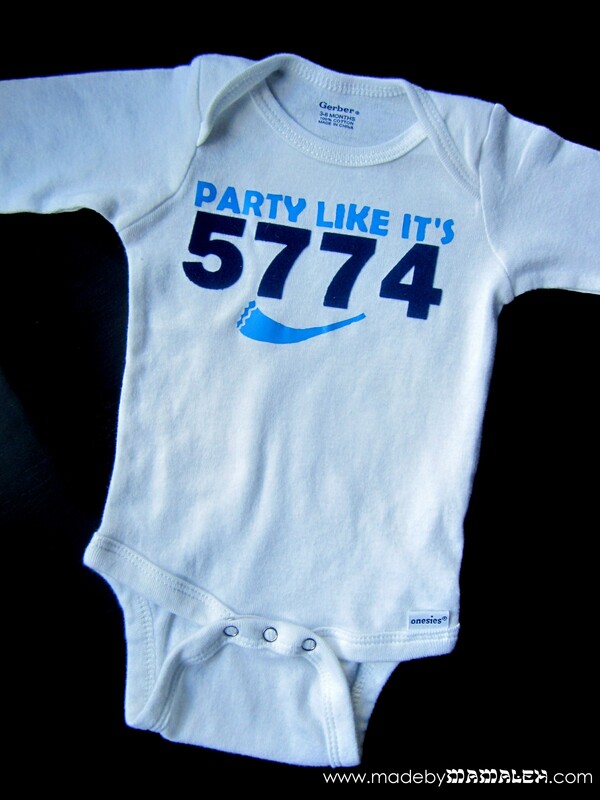 The easiest to find are the Gerber Onesies which come in several variations – long-sleeved, short-sleeved, side-snap. A little searching and I also found a bunch of Disney ones on Amazon that got great reviews and come in lots of great colors. In addition to white, I got these bodysuits with red stitching, perfect to go with apples n’ honey. The reviews did not disappoint – they are super soft and well made. Note I washed all the onesies before I started to account for any shrinkage. My first design, for a little boy, I decided to do something a little silly and fun. I managed to find a great easy to cut shofar graphic which I then cut out of Easyweed Sky Blue heat transfer vinyl along with the sentiment (font=Berlin Sans FB Demi) using my Cameo (which if you’ve been following me for a while, you know is one of my favorite toys). The 5774 (this is the new Jewish year) was typed in Franklin Gothic Heavy and cut out of Navy Flocked vinyl. I love the result! And since I cut numbers using my Cameo, I entered it into the Silhouette Blog Weekly Shape Challenge. Next, I saw this totally darling Rosh Hashanah bib on etsy (which if you aren’t in a crafting mood, would be a fun pre-fab alternative to today’s projects) and I decided to make my own version using several types of vinyl: black flocked, red flocked and gold glitter. Font used is Unicorn NF. All graphics from the Silhouette Online Store: apple, apple core, bee and honey pot. I have to confess though, the other inspiration for this one came from little Miss Maggie and the card she made last year. Well, I couldn’t stop there since there are oh so many babies celebrating their very first Rosh Hashanah so I decided to keep with the apples and honey theme, this time using Pacifco and Aharoni fonts but sticking to the same colors and just changing things up a bit. These were so much fun to make, I may just have to do a couple more! Can’t wait to see all the cuties wearing their new year gear! Do you realize Rosh Hashanah is now less than a week away???? Another kid-friendly project coming tomorrow along with a little giveaway…so stay tuned! 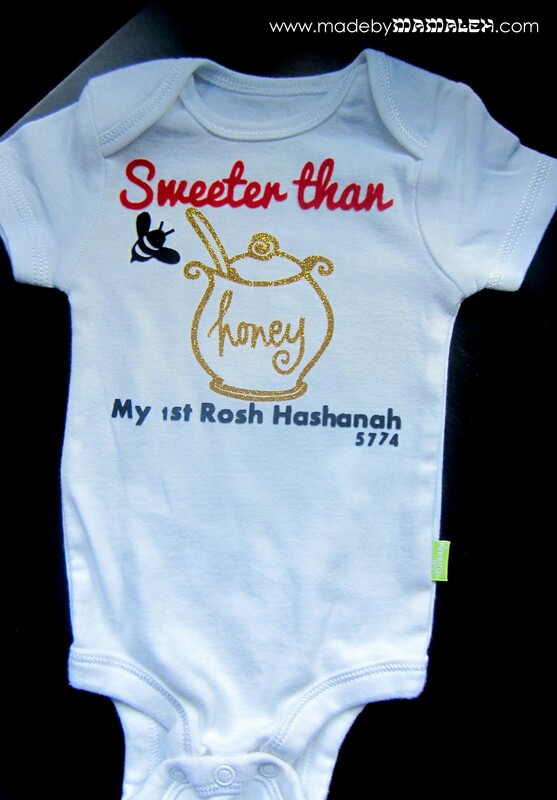 This entry was posted in Baby, Clothing, Gifts, Rosh Hashanah and tagged heat transfer vinyl, Rosh Hashanah, Rosh Hashanah baby gift, Rosh Hashanah onesie, Silhouette Cameo. Bookmark the permalink. ← It’s Time for A New Jewish Calendar, Again! Adorable, and so original! 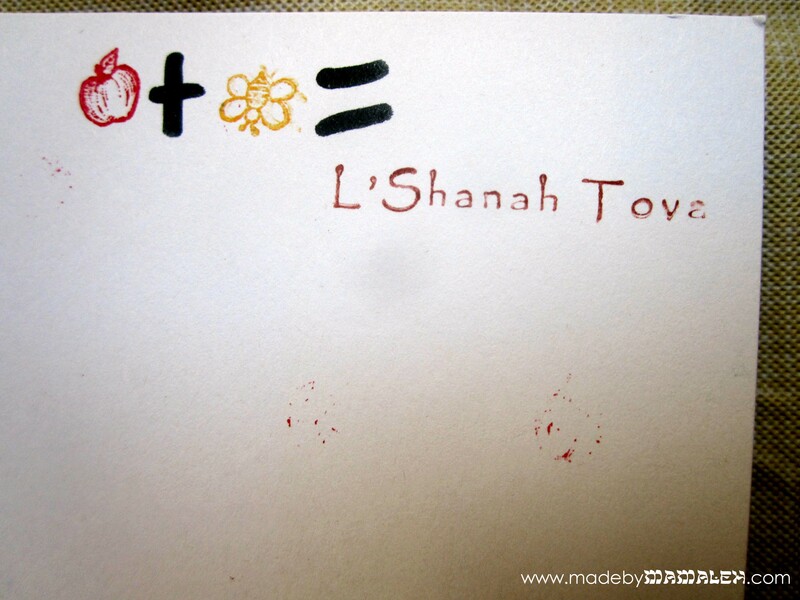 thanks so much for sharing on craft schooling Sunday and Shanah Tovah!